While researching the Macsen’s Treasure series, I’ve spent a lot of time looking for forms of rituals or ceremonies that Celtic British people of the 5th century might have used to celebrate their holidays. Unfortunately, though we have some notion of the existence a few holidays and their meanings, we have no clues to the actual rituals, if any, that might have been performed. In the Welsh language, the name for one of these old holidays is Nos Galan Gaeaf . It literally means the eve of the first day of winter. The early pagan Irish called it by the more familiar name, Samhain (pronounced SAW-en). In ancient times, the festival was celebrated over a three day period beginning at sunset on the 31st of October. According to the old Celtic calendar, the holiday not only marked the end of the harvest season when people completed their preparations for winter, but it also denoted the end of the old year and the beginning of the next. Like other ancient Celtic festivals, Nos Galan Gaeaf has continued into modern times under a newer name. In the 8th century the Christian church moved the feast day of All Hallows’ Day to the 1st of November and incorporated it into the older festival, which became known as All Hallows’ Eve, or what we now call Hallowe’en. Later, All Hallows’ Day was renamed All Saints’ Day. All that is left to us of the older festival are the remnants that evolved into modern trick-or-treating, jack-o’-lanterns, and costume parties, as well as the made-up rituals of modern neo-paganism. As I developed the story line of the book A Land Beyond Ravens, I found that I needed to create a scene that takes place on Nos Galan Gaeaf. From earlier research I already knew that Celtic people believed that this was the time when the boundary between the conscious world and the Otherworld, called Annwn, dissolved and that some souls who had passed to Annwn through death might return and be seen to walk among the living. Superstitious folk feared these spirits and attempted to keep them at bay with bonfires. Over time, the use of costumes and masks began to be worn as well, to either imitate or placate the spirits. Great. But this still didn’t give me a ritual. Once more I scoured reference books and the internet for more information, but I was left with the old adage, when in doubt, punt. So I got out the steel-capped boots (or should that be the steel-capped pen?) and had at it. Most of my characters certainly believed in Annwn. In the scene in question I decided to have members of the clan of Dinas Beris gather around a standing stone with their druid. The druid speaks in a soothing tone about the time of year and its meaning. In this gathering, I’ve visualized that the people have brought personal mementos from either someone they’ve lost or an ancestor they admired, and use the memento to try to draw that person’s spirit to them. Claerwen, the Lady of Dinas Beris, has brought a lock of her dead step-son’s hair as well as a lock of hair from her husband, Marcus, because she believes the boy’s soul has been trying to warn her of something bad that will happen. She has placed both locks in an amulet she wears around her neck. Claerwen never gets the chance to “see” the boy. She runs into Marcus while he’s on his way to a nearby stronghold. Her father was taken hostage and Marcus wants to try to get him released. Guess how? He’s painted his face in a spooky way that scares her until she realizes who it is she’s run into. His intention is to go scare the guards—as a Nos Galan Gaeaf ghost or spirit on the loose—into letting his father-in-law go. Of course Marcus gets sidetracked before the task is accomplished. One thing that I absolutely did not want to do was give in to the gory horrors that became attached to the holiday in later times through superstitions, wild imaginations and modern special effects. I’ve read a number of books by modern Arthurian novelists that have a lot of weird, grotesque forms of paganistic rituals that are written simply for the shock value. When a story line and writing flow well, I don’t think authors should feel the need to succumb to such unnecessary, gratuitous tactics. So the result in my book is that I’ve portrayed the ritual itself in a rather mild manner. It’s the emotional value of the characters that carries the scene. Interestingly, like the ancient Celtic calendar, even into the ninth century in the Christian era, days were still measured from sunset to sunset. In thinking about how the year was measured in early times, compare it to how we measure the time of day now. If the year ends at Nos Galan Gaeaf, the beginning of winter, this is the sunset of the year. In relation, Midwinter, the winter solstice, would mark the midnight of the year. The spring festival Beltaine, or May Day is the sunrise, and Midsummer, the summer solstice, is the noon of the year. To me this makes more sense than the way calendars look now, with the so-called first day of winter on the 21st or 22nd of December. By then, hasn’t it already been cold for quite a while? And in many places snow has been on the ground for some time? Perhaps, if the popes and church of long ago had not messed with the calendar (and please tell me why they had the authority do this? ), we might have retained a different sense of how our world courses from day to day and year to year. Many questions that pop up in discussions about writing revolve around point of view (POV). Most novels are told in either first person (“I am the narrator”) or third person (“S/he is the narrator.”) A third less popular option is the omniscient third person—in effect like an all-seeing camera panning across the whole scene and taking in everything. By nature, first person POV should put the reader closest to the storyteller. The narrator tells his/her own story straight to the reader. Third person moves the perspective back a step. The reader hears the same story, but a third party narrates through a character’s eyes. It can be told as if one character sees the action, or can move back and forth among several characters’ observations. Marcus drank another swig of uisge, enjoying the languid feel of being drunk. He sat on the floor, propped against the fire pit's stones, wondering when he had moved there. The house was quiet, and Claerwen's words about the magical grail came back to him. Slowly he straightened up as an idea came to him. He reached across and shook Myrddin awake. Marcus tossed back another swig of uisge. Damn, it felt fine to be drunk. The mellowness made his whole body languid. He had dropped off the uncomfortable stool onto the floor and sat propped against the fire pit stones. He didn't remember when he'd moved there. Except for the hiss of the fire, quiet descended on the house. Claerwen's words about chasing after a magical grail repeated in Marcus's head, an echo in the uisge. Slowly he straightened up. "Myrddin," he said. Still sitting, the Enchanter dozed, his head drooping. Marcus reached out and shook his wrist. "Myrddin." "What if we start a rumor?" Through dialogue and interior monologue, Marcus's thoughts show much more clearly in the second version. The use of active verbs instead of passive, or active verbs with more punch encourages a better sense of the character as well. To take the notion a step further in the same discussion, I quoted the opening lines from two different novels the group had recently read. This demonstrates the same issue, but in the first person POV. I, Gwalchavad, Lord of Orcady, write this. And no gentle labor it is. Nor less rough the reading, I fear. Unlike Myrddin, or the brown-cloaked clerics, I am no master of the scribbler's craft. Damn it. I haven't time to lie here. Whatever comes, there's more for a king to do than squat like a mushroom and maunder on eternity. Dignity be damned, it's a tedious bore. Even when he was wounded, Ambrosius told me he hated being carried in a litter like a silly bride. Slow, uncomfortable, and wounds open up anyway. Mine are rather bad. The surgeons tell me to prepare for their ministrations—Jesus spare me professional gravity—and that priest looks so solemn, I think God must have caught him laughing and made him promise never again. In the second example Arthur is lively, even though he’s on his deathbed, and what's going on in his head is very clear, very strong. The first example is bland and the narrator is putting himself down as a lousy storyteller. Why should someone want to continue reading if they're being told this right in the first few lines? To me it sounds like a take-off on writings by Geoffrey of Monmouth or Nennius, two medieval writers, both of whom started their narratives like that. Quite a number of modern Arthurian-based novels start this way—seems to be a trend to imitate the old sources of Arthur’s story—but gee whiz, why sabotage the reader from the start? I think “closely held” is a great term. Maybe it’s been out there all along. Not having gone through an MFA or anything like that, I’ve relied on observation to learn the craft. And after all, isn’t observation the key to writing good characters? After two years of working on the fourth book in the Macsen's Treasure series, I've finally settled on a title: A Land Beyond Ravens. All of the book titles in the series come from dialogue spoken by Myrddin Emrys (Merlin). I knew long ago it would mention something about ravens, but that was all. The book is expected to be released sometime in 2009. No specific date has been set yet. Will know more soon. What was that fellow’s name? A fictional character’s name is as important as the story to which the character belongs. The name not only needs to be appropriate to its owner’s personality and actions, but appropriate to the time as well. Little credence would be given to a story about one of King Arthur’s knights if he were called something like Joe Smith. In the final book of the Macsen’s Treasure series, A Land Beyond Ravens, I needed a name for a man who turns out to be the son of another character who died a long time prior to the story’s setting. This character also, in time, becomes one of Arthur’s warriors. So where to look for a name? From the vast body of medieval Arthurian literature, many lists have been compiled that name Arthur’s knights. They range from short groups of twelve to twenty-four men, presumably the original Knights of the Round Table (think of Gawain, Lancelot, Dagonet, Bors, Gaheris, et al. ), to far longer lists of 150 people. The lists are compiled from various sources: the tales of Culhwch, The Dream of Rhonabwy, the Welsh Triads (Trioedd Ynys Prydein) and Welsh genealogical tracts. Some of the listed are actual historical personages, some are fictional, others may be historical but their existence not proven. Not to give away one of the book’s plot twists, but the dead character was called Taran, his name based on Taranis, the Celtic god of thunder. (He was a noisy pain in the …) When he appeared back in the first book, I had no idea that he would ever have a son. Now, years later, in search of that son, I spent an untold amount of time perusing the name lists, looking for one that was appropriate as well as reasonably simple to spell and pronounce. Many of the names, in early Welsh, are incredible tongue twisters and not necessarily good for an English-speaking readership. After not finding anything I was really happy with and barely able to get my eyes to focus any longer, I pulled out another book, The Arthurian Name Dictionary. This book, invested in a long time ago and nearly forgotten on a back shelf, contains practically all the names known to have been associated with Arthurian legend. Gads, five hundred pages to search! Where to start? On a whim, I looked for the name Taran. Can you imagine the amazement and delight when I came across that very name in this book? And underneath, the entry says, “Father of Arthur’s warrior, Glinyeu.” It came from the Welsh story of Culhwch. Hot dog! I then raced to the entry of Glinyeu and found he fought in the army of a warrior named Gwythyr, one of Arthur’s men and father of Gwenhwyfar. The stories noted in these entries are mythological and probably existed before Arthur’s alleged historical period of the late fifth and early sixth centuries. Arthur and his companions were likely absorbed into them over time as the stories were told and re-told orally. When they were written down in much later times, the absorption became permanent. While the mythological aspect of Glinyeu ap (son of) Taran is not pertinent to my story, the name is perfect and that he became one of Arthur’s warriors fits better than I had hoped when I started the search. Who knows, perhaps he is one of those legendary figures who may have actually been historical but can’t be proven to have lived. Here is a view to the north across Snowdonia from near Dinas Emrys (in the lower right corner). The yellow markers show where significant events happen, or are prophesied to happen, in the fourth book. The story includes the notion that the battle of Camlann--Arthur's final battle--occured in Cwm y Llan in North Wales. This legend has never been substantiated historically, however, no other location has been proven either. As an addendum to the last post about Google Earth--my wish for updated photos was granted! 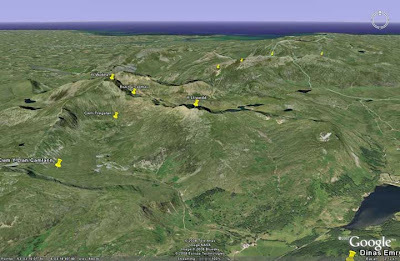 At least they were updated in the region of Snowdonia I've been working with lately. The ground is in the first green of Spring instead of the dull brown of Autumn. And they are very clear. Thanks, Google Earth!